A portrait of 16th century Danish astronomer Tycho Brahe, who died in 1601 and was entombed in Prague. Archeologistsare exhuming the body of 16th century astronomer Tycho Brahe from atomb inPrague to solve long-standing mysteries over the famed Danishscientist'shealth ? and possibly, his death. Thecondition of Brahe's remains, which have been undisturbed for 109years, isunknown, researchers said. "Wedo not know what we are likely to find in terms of material, nor do weknow howthe bones have been preserved," said archaeologist Jens Vellev ofAarhusUniversity, who is leading the work. Afilm crew is following the project for a documentary on the Braheinvestigation. "Thisis an outstanding opportunity to follow a group of Danish and foreignresearchers as they attempt to shed light on the Tycho Brahe era, hislife andnot least his death," said documentary producer Anna Elisabeth Jessenofthe Danish Broadcasting Corporation. Brahe was aprolific astronomer who died in 1601 and is known for making the mostaccuratemeasurements of stars and planets without the aidof a telescope. Brahe'sdeath has long been attributed to a bladder infection contracted afterhisbladder ruptured during a royal banquet where politeness and conventionkepthim from leaving the royal table to use the bathroom. Brahe was born inDenmarkin 1546 and served as an astronomer for the king of Denmark beforesettling inPrague. Brahe'stomb has been opened only once before, in 1901, to mark the 300thanniversaryof his death. But records of that tomb opening are fleeting. "Nomeasurement data or photographical details exist from that time, onlyphysicaldescriptions of the skeletal remains," Vellevsaid. "We cannow supplement thesewith a number of analyses, so you could say that we are completing theinvestigation that was begun in 1901." Vellev andhis team plan to drill a hole into the bricked-up crypt at T?n Churchcontaining Brahe's coffin. Brahe's remains were interred in a nearly5-foot(1.5-meter) coffin made of tin. Once the holeis drilled, a remote-controlled camera will be lowered into the crypttoinspect the condition of Brahe's coffin. The coffinwill be removed and transported to a laboratory in Prague before beingopened. "Theteam hope to find bones and remains of a beard, the earthly remains ofTychoBrahe," AarhusUniversity officials said in a statement. Scientistsare also interested in recovering any shreds of Brahe's burial suitthat couldallow them to reconstruct the astronomer's aristocratic outfit inpatternedsilk. The scienceteam has only four days to study Brahe's body. On Friday, the Brahe'sremainsand those of his wife ? who was buried by his side in 1604 ? will bereburiedafter a memorial ceremony. 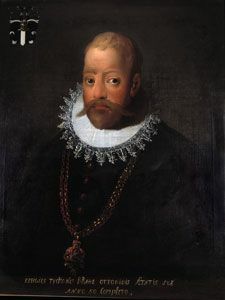 The resultsfrom the new study of Brahe's remains are expected to be releasedsometime in2011.